Lydia Rohde smiles on the bench while out with an injury. The senior guard’s good friend, junior forward Pallas Kunaiyi-Akpanah, said Rohde’s bright teeth were the first thing she noticed about her. 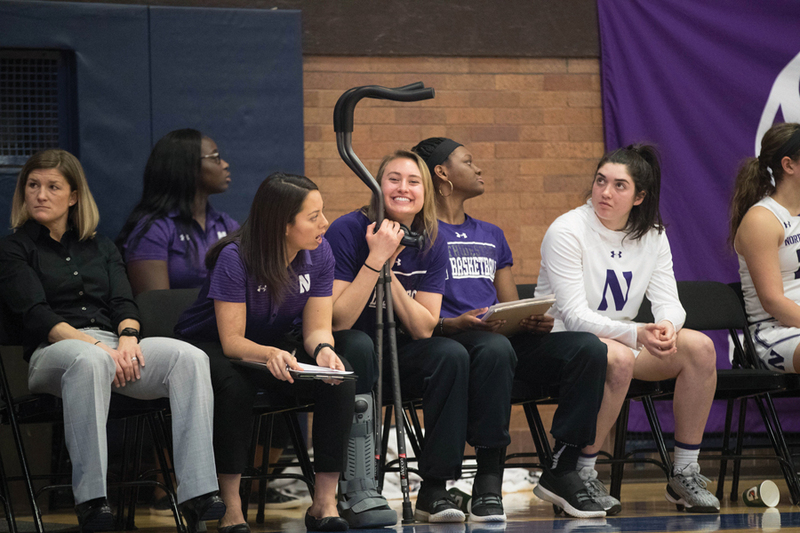 When it comes to Northwestern’s friendships on and off the court, there’s the old school and there’s the new school. Junior forward Pallas Kunaiyi-Akpanah and senior guard Lydia Rohde, two well-seasoned collegiate players, stand out as two best friends on the team. The freshmen trio of guards Lauryn Satterwhite, Jordan Hamilton and Lindsey Pulliam make up the other squad. According to Satterwhite, her, Pulliam and Hamilton were destined to be best friends. Yet Hamilton said based off her first impressions of Pulliam and Satterwhite, she wasn’t so sure. Kunaiyi-Akpanah and Rohde first met back in 2015 when Kunaiyi-Akpanah was a freshman, and though their first meeting was now long ago, Rohde’s first impression of Kunaiyi-Akpanah is still fresh in her mind. From there, Rohde and Kunaiyi-Akpanah grew closer, bonding over commonalities like their intense love for scary movies and sharing memes on Facebook, Rohde said. One of the biggest bonding points for Kunaiyi-Akpanah and Rohde is their love for books, Kunaiyi-Akpanah said. Though the freshmen trio met one another far more recently, an important bonding catalyst for Satterwhite, Hamilton and Pulliam’s relationship is their similar personalities and love for the sport, Pulliam said. They push each other to do better every day. A love for basketball links the whole team together. According to Satterwhite, when everything basketball related is over, whether it be a day’s practice or the 2017-2018 season, the friendship will always still be there. The memories made are always there. Many memories have been made between Rohde and Kunaiyi-Akpanah, but Kunaiyi-Akpanah pinpointed a particularly humorous one.